Students at one of Denmark's leading media schools are enjoying extra clarity thanks to a campus wide upgrade to the cameras used as part of the University curriculum. The Danish School of Media and Journalism is a training and knowledge centre for the media and communications sector with a focus on talent, lifelong learning and innovation. It is Northern Europe's largest centre for journalism training and skills, with more than 1300 course participants and students. 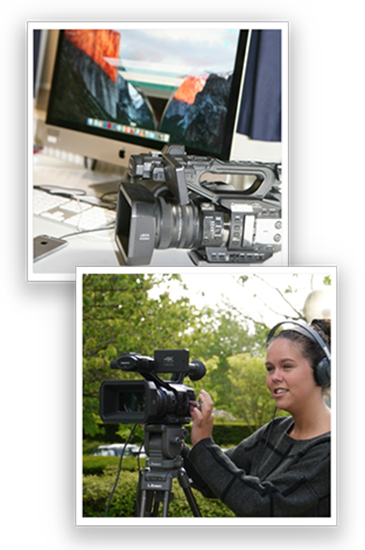 In total four classes within the university are making use of the latest additions to Panasonic's professional 4K camera line up, the AG-UX90 and AG-UX180 - two cost effective, high-power zoom, integrated lens camcorders. Successors to the company's AVCCAM series of professional AVC HD camcorders, the UX premium model (AG-UX180), is equipped with a 1 type MOS sensor, optical 20x zoom and UHD 60p recording capability, while the UX standard model (AG-UX90), features a 1-type MOS sensor, optical 15x zoom and UHD 30p recording. Both feature a rugged design for heavy duty field use. Hans Norgaard -Technical Manager for the TV and Radio Department said, "We have used Panasonic HD camcorders for the past six years with great success, so when it came to replacing them I was keen to continue using the brand. "We have students, who arrive on day one having very little experience of using cameras and we have students in their final year of study, having spent 18months working in industry, who are incredibly skilled camera operators. "Support on the old cameras was excellent, and I hope we get the same going forward." The University purchased 20 of the AG-UX90 and seven AG-UX180 from Panasonic partner MedieTek, with the UX180 used for the final year projects that the students need to deliver - usually documentary films, lasting upwards of 25 minutes. "The cameras are accessible to both groups, you can use the manual mode if people have a good knowledge, while the auto settings are easy to use for first timers," adds Hans Norgaard. "The feedback we have received on the auto iris, auto focus and auto white balance has been overwhelmingly positive. The students like that both cameras have a better depth of field to what they were previously using, so that they were able to create more professional looking, cinematic films." Service quality was also an important factor for the University. MedieTek looked after smaller repairs in Denmark, with any more complex service needs met at Panasonic's European service centre in Cardiff. Panasonic offers a faster turnaround time for business, with five-day turnaround times (TAT) from collection to delivery. "The students like that both cameras have a better depth of field to what they were previously using, so that they were able to create more professional looking, cinematic films"
"Support on the old cameras was excellent, and I hope we get the same going forward," added Hans Norgaard. "That's why we looked carefully at build quality, when something isn't your own, you don't treat it as well, so a fast service turnaround time was very attractive." "We also conducted side by side testing with a competitor product and we found the UX series had a certain quality we were looking for, firstly the picture quality is great but also the user buttons are placed more ergonomically. We have a lot of beginners, so this an intuitive design is important." Henrik Laier, from Panasonic distribution partners MedieTek said, "Danish School of Media and Journalism was the first to buy the camera as it had only just been launched and since then the UX series has been very popular among higher education institutions. "But overall, we are seeing a dip in demand for camcorders, as many universities are playing around with mobile. From what we've seen though, once you buy the additional sound equipment you need, the price becomes equivalent to a good camcorder, which will ultimately deliver a far better final product and prepares students for the actual technology they would ultimately use on the job."